Bandung School of Pharmacy, Bandung, West Java, Indonesia. ABSTRACT: Propionibacterium acnes is one of the bacteria that causes acne. One of the natural ingredients that potentially as anti acne is kefir. Kefir is a product of fermented milk with starter kefir grain. The fermented kefir is incorporated into the gel product for acne treatment. The purpose of this study was to formulate the fermented kefir in the gel product and to test the antibacterial activity against Propionibacterium acnes. Fermentation in cow's milk, goat's milk, and soy milk using starter of kefir grain with concentrations of 2%, 5%, and 7% in each type of milk. One best base formula is added to fermented kefir. Evaluation of the preparation includes organoleptic, homogeneity, dispersion, pH, viscosity at room temperature, accelerated stability test, antibacterial activity test, and panelist test. The best gel base is FT3 with Viscolam® MAC 10 concentration of 8%. The concentration of fermented kefir from cow's milk, goat's milk, and soy milk is incorporated into gel products, i.e. 5%, 7%, and 2%, respectively. Stable gel based on organoleptic observation and homogeneity. Spreading power increases during storage. On pH measurement, Gel FA and FC are stable. On viscosity measurement there are significant differences during 28 days storage. Fermented kefir can be formulated in gel products. The stable gel preparation formula is FC based on the pH parameter but its viscosity is unstable for 28 days storage at room temperature and accelerated stability test. FC gel has the highest antibacterial activity with mean inhibit zone diameter of 12.67 ± 1.15 mm. INTRODUCTION: Healthy and clean facial skin would want to be owned by everyone. However, because of an unhealthy lifestyle can make facial skin damaged. Acne is one of the health problems on facial skin that is still often complained by almost everyone, especially teenagers. The main cause of the appearance of acne is the increased production of sebum or oil in the sebaceous glands that can close the pores of the skin. The situation has the potential to bind dust and dirt and support the growth of acne-causing bacteria Propionibacterium acnes 1, 2. Synthetic drugs or antibiotics are drugs that are widely used to treat acne. However, the use of synthetic drugs or antibiotics sometimes cause side effects such as skin irritation 2. One of the natural ingredients that have the potential to be developed as an antibacterial is kefir. Kefir is a product produced from fermented milk of cow, goat, or sheep with starter kefir grain 3, 4. Kefir grain contains a mixture of bacteria and yeast 5, 6, 7, 8. Empirically kefir has been used to treat acne. Kefir has a strong antibacterial activity against P. acnes. The water kefir can inhibit the growth of P. acnes bacteria with the width of the inhibit zone of 2.57 cm2. The inhibitory zone exceeds the penicillin block zone as a positive control 1, 2. Acne treatment requires a form of product that has long contact time with skin such as gel and cream. However, the gel product form is better used in the treatment of acne than the cream product form because the gel is easier to clean and does not contain oil that can aggravate acne. Therefore, in this research made formulation of fermented kefir gel product from each milk type which has the greatest antibacterial activity against Propionibacterium acnes. MATERIAL AND METHODS: In this research made kefir gel product containing kefir fermentation as anti acne naturally. Stages of work carried out include the collection of materials, production and characterization of kefir milk, testing of antibacterial activity of kefir milk, optimization and gel base characterization, production and evaluation of fermented kefir gel, antibacterial activity of kefir gel, and product evaluation data evaluation. Cow's milk, goat's milk, soy milk, and kefir grain starter were obtained from East Bandung, West Java. the production of kefir milk is done by preparing 3 pieces of sterile glass jars for fermentation of kefir milk with 3 different starter concentrations of each type of milk. All types of milk are pasteurized at 60 °C for 30 minutes and cooled to ± 25 °C. Furthermore, the milk was put into a glass jar of 500 ml and added starter kefir grain each 2%, 5%, 7% (% b/v), then fermented for 24 h at room temperature. Characterization of kefir milk include organoleptic observation, pH measurement, and total lactic acid determination. An antibacterial activity test was performed to determine the inhibition of kefir in Propioni-bacterium acnes bacteria and to determine a concentration of kefir milk with the greatest antibacterial activity of each type of milk medium to be active substance in gel product. This test uses a diffusion method for paper discs to obtain the inhibitory zone diameter and MIC values of kefir. The positive control used is clindamycin antibiotic while the negative control is sterile aquadest. The gel preparation begins with gel-based optimization by varying the gelling agent concentration. The gelling agent used was Viscolam® MAC 10. A nine formula was prepared by Viscolam® MAC 10 concentration, then spontaneously characterized to determine five selected formulas based on organoleptic observations (form, odor, and color). Furthermore, the three selected formulas were evaluated for 28 days, i.e. the 1st, 3rd, 5th, 7th, 14th and 28th testing days to determine one of the most stable main formulas. The stability of the gel base is seen based on organoleptic observations, pH measurements, and viscosity measurements. In the selected formulation added kefir fermented from each type of milk. After gel was formed, the gel stability evaluation included organoleptic observation, homogeneity observation, pH measurement, viscosity measurement, spreading energy measurement, and freeze thaw test conducted over 28 days i.e. 1st, 3rd, 5th, 7th, 14, 21, and 28. The product of gel kefir has also been made by panelist test and antibacterial activity test. The gel evaluation data from the research results were analyzed by Analysis of Variation (ANOVA) method using SPSS program. Production of Fermented Kefir Milik: One indicator of the occurrence of fermentation is a decrease in pH value of milk kefir. The decrease in pH values is due to the activity resulting from lactic acid bacteria and yeast present in kefir grain. Lactic acid bacteria will produce lactic acid while yeast will produce alcohol. The longer the fermentation process, the lactic acid formed will be more and more, so the pH of kefir milk decreases. Lactose present in milk will be converted to lactic acid by kefir grain 9, 10. Lactic acid bacteria convert lactose into glucose and galactose, then glucose is converted to lactic acid 11, 12. Lactic acid bacteria produce β-galactosidase enzyme to convert milk lactose into glucose and galactose which can be used as a growth medium of lactic acid bacteria 13, 14. Soy milk is different from cow's milk and goat's milk because it does not contain lactose. The type of carbohydrate in soy milk is oligosaccharides that cannot be used directly as a source of energy or carbon source by microbes in kefir grain. Therefore it is necessary to add a sugar source to soy milk before it is fermented by lactic acid bacteria. The sugars that can be added are sucrose, glucose, lactose, fructose, or skimmed milk powder 3, 12. Organoleptic Observation: These observations include the aroma and texture of fermented kefir milk Fig. 1. After fermented 24 h, all kefir milk from cow's milk, goat's milk and soy milk has a distinctive aroma of sour and is formed into 2 phases, namely white solid part and yellowish liquid part. pH Measurement: The result of pH measurement of kefir milk showed that after the fermentation process there was a decrease of pH value of all types of milk which originally had pH 7 to pH 5 for addition of 2% kefir grain starter in each type of kefir milk, while the addition of 5% and 7% kefir starter decreased pH to pH 4. The pH value is in accordance with the requirements of kefir milk which has a pH of about 3.8 to 4.6 15, 16. The higher starter concentration is added, the resulting pH value decreases. Determination of Total Lactic Acid Level: The results obtained with the highest levels of lactic acid were 1.16% in kefir from cow’s milk with addition starter 7%, 1.19% in kefir from goat’s milk with addition starter 7%, and 0.92% in kefir of soy milk with addition starter 5% Fig. 2. 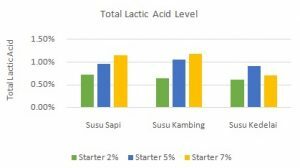 The higher the starter concentration of kefir grain added, the more acid produced. This is due to the activity of lactic acid bacteria in breaking lactose 8. Test of Antibacterial Activity of Kefir: Before it is incorporated in the gel, first testing the antibacterial activity against kefir using the diffusion method for paper disc. The fermented kefir milk is separated between the clear part of the viscous white portion in order to obtain a gel product which has clear or transparent color after the active ingredient of kefir is fermented. The clear part of kefir milk was tested for its antibacterial activity and compared with clindamycin antibiotics as a positive control. The antibacterial activity test results Fig. 3 showed kefir forming a inhibitory zone around the paper disc. The inhibitory zone is caused by a lactic acid compound suspected to be an antibacterial of kefir. Lactic acid in the undissociated form at low pH can be toxic to various microoganisms 3, 4. The low pH values ​​result in cytoplasmic cells acidifying or becoming acidic, altering the permeability of the cell membrane and disrupting the substrate transport system. Based on the test results at 2% starter concentration of each kefir of cow’s milk, goat's milk and soy milk produce inhibition zone 8.33 ± 0.58 mm, 9.67 ± 2.08 mm, and 9.67 ± 0.58 mm respectively. However, the antibacterial activity of kefir is still lower than the antibacterial activity of positive control of clindamycin antibiotic which reaches the inhibition zone of 14.33 ± 2.31 mm. Observation of Gel Based Organoleptics: Based on organoleptic observations that have been done on the five selected formulas for 28 days, it was found that all selected gel formulas had clear or transparent color and distinctive flavor. pH Measurement of Gel Base: The pH measurement aims to determine the safety of a topical product. The pH values of all selected gel base formulas decreased during the 28-day evaluation Fig. 4. On the 1st day the pH values for FT1, FT2, FT3, FT4, and FT5 were 8.74 ± 0.21, respectively; 8.53 ± 0.07; 8.8 ± 0.10; 8.37 ± 0.25; 8.46 ± 0.42. After 28 days storage each formula showed a pH value of 8.42 ± 0.19; 8.51 ± 0.12; 8.07 ± 0.25; 8.09 ± 0.04; 8.00 ± 0.38. Based on the results of the gel base optimization for 28 days, the preferred formula having the pH value closest to skin pH was the formula FT3, FT4, and FT5. Viscosity Measurement of Gel Base: The viscosity of the gel base was measured by the Brookfield Viscometer using a 5 rpm shear rate and spindle no 5. Based on the results of the viscosity evaluation showed that the higher viscosity concentration increased viscosity Fig. 5, due to the thickening nature of TEA. Based on the viscosity measurement, the gel base concentration having a lower viscosity than FT5 but not very viscous is FT3. Selected one gel base formulation to be the main formula of FT3 with Viscolam® MAC 10 concentration of 8%. Organoleptic Observation: Organoleptic obser-vation results show that the gel that has been added to fermented kefir as an antibacterial substance produces different colors. Gel FA (cow kefir with 5% starter) and FC (soy kefir with 2% starter) have clear / transparent color while FB (goat kefir with starter 7%) is opaque. In the three gel formulas that have different types of milk and starter concentration did not affect the aroma of gel products that are formed. All gel formulas have a distinctive aroma of fermentation from the addition of fermented kefir. During storage of 28 days, all gel formulas do not change color or aroma. Homogeneity Observation: Observation of homogeneity aims to determine whether all the ingredients in the gel formulation have been evenly mixed or not and may affect the drug distribution of a product 17. Homogeneity is indicated by the absence of coarse grain on the product 18. Based on homogeneity observation result showed that the gel formula FA, FB and FC showed the existence of color equation and the absence of coarse particles so that it can be said that all gel products are homogeneous. Spreading Power Measurement: Spreading power measurements were performed to determine the ability of the gel to spread at the site of use and ensure equalization or gel when applied to the skin. It should be evaluated as it may affect the absorption of the drug and the rate at which it is released. Spreading capacity for a good semi-solid preparation for topical use is about 3 - 5 cm in diameter. In addition, the product is eligible if the preparation can spread easily to the skin and its use feels comfortable 17, 18. Based on the result of the measurement data for 28 days, the gel has increased the power of spread Fig. 6. In FA, FB and FC contain different fermented kefir and starter concentrations that may affect gel viscosity. A low viscosity value can cause the gel to spread more easily when given a load. Good products require relatively little time and load to spread and have a wide spread 19. A product is semi-rigid if it has a power diameter of <5 cm, while a product is semi-liquid if it has a spreading power diameter of 5 - 7 cm 19. In this study, the three gel formulas can be categorized into semi-rigid products because they have a power of <5 cm. pH Measurements: The pH measurements were performed on days 1, 3, 5, 7, 14, 21, and 28 at room temperature. This is done to see the level of acidity of the preparation to ensure the product does not cause irritation to the skin. Pharmaceutical products given topically and transdermally pH must be adjusted to the pH of the skin. The product should not be too acidic or too alkaline as it may cause skin irritation 20. Based on the measurement results obtained pH value for FA, FB, and FC respectively on the day-1 that is 8.76 ± 0.04; 8.61 ± 0.09; and 8.76 ± 0.04. After 28 days storage each formula showed a decrease in pH values respectively, i.e. 8.65 ± 0.13; 8.76 ± 0.06; and 8.64 ± 0.14 Fig. 7. The results of pH measurement of Gel Kefir based on statistical data processing using ANOVA method showed on FA gel formula (sig = 0,636) and FC (sig = 0,375) no significant difference. While on FB gel (sig = 0,026) showed a significant difference. Based on all the data, the gel formula FA and FC can be interpreted that the stability of both pH is stable, while the FB gel formula is unstable. Viscosity Measurements: Viscosity measurements were performed on days 1, 3, 5, 7, 14, 21 and 28 using the Brookfield Viscometer tool with spindle 5 at 5 rpm on the FA, FB, and FC gel formulas. The purpose of the viscosity measurement evaluation is to know the consistency of the product that may affect the process of using topical products. The higher the viscosity of a product, the more difficult it will be applied to the skin, the lower the viscosity of the product will be more easily applied to the skin 20. The result of the viscosity measurement shows that the longer the storage time the viscosity in each formula decreases Fig. 8. This can be due to the longer the storage, the longer the product is affected by the environment such as air. The addition of propylenglycol to a product that serves as a humectant that can attract water so that the dosage is more dilute and its viscosity decreases 20. Based on statistical analysis, on the FA gel (sig = 0,000), FB (sig = 0,000), and FC (sig = 0,000) there was a very significant difference (sig <0.05). This indicates that the viscosity of the three formulas during the 28-day storage period is experiencing instability. Favorite Test: This favorite test shows the favorite color, aroma and comfort on the fermented kefir gel. 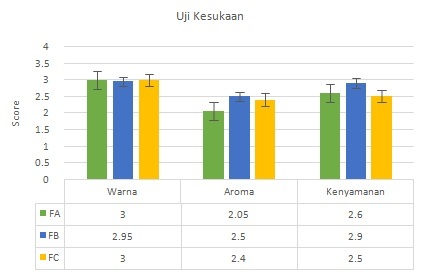 The results showed that the formula that obtained the highest value of the color category is FA and FC, while for the category of aroma and comfort obtained the highest value on FB. Based on the hedonic parameters from range one to four, it can be seen that the average panelist likes the gel formula colors FA and FC, while for the aroma and comfort parameters, the average panelist likes FB gel Fig. 9. The overall average score for gel formulas FA, FB, and FC were 2.55, respectively; 2.78; and 2.63. The results show that panelists tend to like the FB gel formula. Irritation and Safety Test: The irritant test aims to determine whether the pH of the preparation is still acceptable and does not cause undesirable effects under normal skin conditions. When the product has too acidic pH it can cause skin irritation and if too alkaline may cause scaly skin. The results showed that FA, FB, and FC gel did not arise irritated and itchy reactions Fig. 10. All three formulas have a cold sensation in the skin and arise stickiness. Based on the hedonic parameters from range one to four, it is known that the average dosage does not cause irritation and itching sensations on the panel. The average panelist tends to feel a cold and sticky sensation for all gel formulas. The overall average score for gel formulas FA, FB, and FC were 3.35 respectively; 3.32; and 3.18. The results show that panelists tend to like the FA gel formula. Activity Antibacterial Test of Kefir Gel: The fermented kefir gel was tested for its antibacterial activity using the diffusion method for paper disc and compared to the antibacterial activity of the gel product on the market, Medi-Clin gel. The results of antibacterial activity test showed all kefir gel formula had strong antibacterial activity more than 10 mm Table 1. Gel FB and FC have obstacles beyond the gel base control. However, the antibacterial activity of all kefir gels is still lower than the antibacterial activity of positive control of Medi-Clin gel. The statistical results showed that the gel formula FA, FB, and FC did not differ significantly with the positive control of Medi-Clinic gel with a sig value of 0.604 (sig> 0.05), so that it can be interpreted that all gel formulas have antibacterial potency not much different or almost the same activity with positive control. CONCLUSION: Based on the results of research that has been done can be concluded that all gel products are stable based on organoleptic observation and homogeneity and have anti-bacterial activity against P. acnes. Formula Gel FC has the highest antibacterial activity with mean inhibit zone diameter of 12.67 ± 1.15 mm. The result of ANOVA one-way evaluation and ANOVA analysis showed that FC gel formula was the most stable product based on pH parameter but its viscosity was unstable during 28 days storage. Nazipi S, Stodkilde K, Scavenius C and Bruggemann H: The skin bacterium Propionibacterium acnes employs two variants of hyaluronate lyase with distinct properties. Microorganisms 2017, 57(5): 1-16. Kum H, Roh KB, Shin S, Jung K, Park D and Jung E: Evaluation of anti-acne properties of phloretin in vitro and in vivo. International Journal Cosmetic Science 2015; 1-8. Rosa DD, Dias MMS, Grzeskowiak LM, Reis SA, Conceicao LL and Peluzio MG: Milk Kefir: Nutritional, Microbiological and Health Benefits. Nutrition Research Reviews 2017; 1-15. Arslan S: A review: chemical, microbiological and nutritional characteristics of kefir. CyTA J Food 2014; 13: 340-345. Ahmed Z, Wang Y and Ahmad A: Kefir and health: a contemporary perspective. Crit Rev Food Sci Nutr 2013; 53: 422-434. Nielsen B, Gürakan GC and Ünlü G: Kefir: a multifaceted fermented dairy product. Probiotics Antimicrob Proteins 2014; 6: 123-135. Ostadrahimi A, Taghizadeh A and Mobasseri M: Effect of probiotic fermented milk (kefir) on glycemic control and lipid profile in type 2 diabetic patients: a randomized double-blind placebo-controlled clinical trial. Iran J Public Health 2015; 44: 228-237. Gomes AC, Bueno AA and de Souza RGM: Gut microbiota, probiotics and diabetes. Nutr J 2014; 13: 60. Carasi P, Racedo SM and Jacquot C: Impact of kefir derived Lactobacillus kefiri on the mucosal immune response and gut microbiota. J Immunol Res 2015; 361604. Fahmy HA and Ismail AFM: Gastroprotective effect of kefir on ulcer induced in irradiated rats. J Photochem Photobiol B 2015; 144: 85-93. Yener AU, Sehitoglu MH and Ozkan MT: Effects of kefir on ischemia–reperfusion injury. Eur Rev Med Pharmacol Sci 2015; 19: 887-896. Chen HL, Tung YT and Chuang CH: Kefir improves bone mass and microarchitecture in an ovariectomized rat model of postmenopausal osteoporosis. Osteoporos Int 2015; 26: 589-599. Punaro GR, Maciel FR and Rodrigues AM: Kefir administration reduced progression of renal injury in STZ-diabetic rats by lowering oxidative stress. Nitric Oxide 2014; 37: 53-60. Noori N, Bangash MY and Motaghinejad M: Kefir protective effects against nicotine cessation-induced anxiety and cognition impairments in rats. Adv Biomed Res 2014; 3: 251. Plessas S, Nouska C, Mantzourani I, Kourkoutas Y, Alexopoulos A and Bezirtzoglou E: Microbiological Exploration of Different Types of Kefir Grains. Fermentation 2017; 3(1): 1-10. Randazzo W, Corona O, Guarcello R, Francesca N, Germanà MA, Erten H, Moschetti G and Settanni L: Development of new non-dairy beverages from Mediterranean fruit juices fermented with water kefir microorganisms. Food Microbiol 2016; 54: 40-51. Sipo E, Szasz N, Vancea, S and Ciurba A: Evaluation and selection of gel base for the formulation of dexpanthenol products. Tropical Journal of Pharmaceutical Research 2014; 13(12): 1987-1992. Jadhav VD, Talele SG, Bakliwal AA and Chaudhari GN: Formulation and evaluation of herbal gel containing leaf extract of Tridax procumbens. Journal of Pharmaceutical and Bioscience 2015; 3: 65-72. Anwar W, Ramadon D and Harmita: Formulation and evaluation of gel and emulgel of chili extract (Capsicum frutescens ) as topical dosage forms. 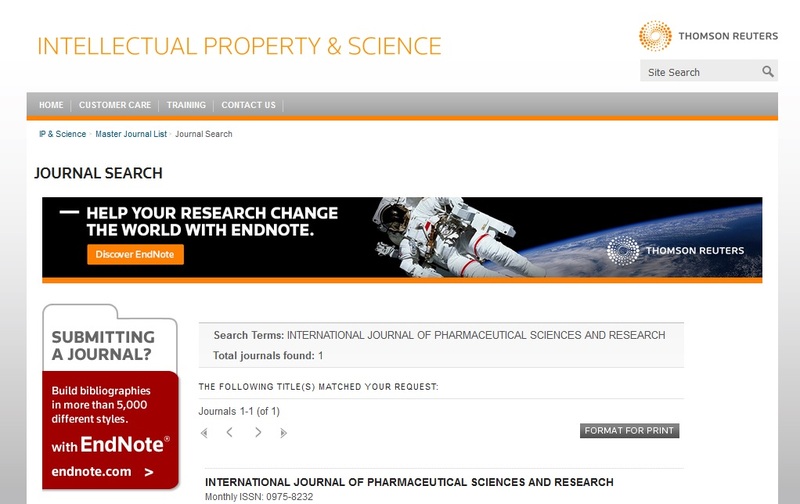 International Journal of Pharmacy and Pharmaceutical Sciences 2014; 6(3): 1-4. Pardeshi MD: Formulation and evaluation of Aloe-vera gel with active salt and alum: As New Dentifrice. 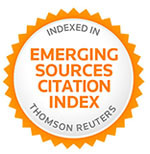 International Journal of Research in Economic and Social Sciences 2016; 6(5): 297-310. Muhsinin S, Miftahussa’adah WM and Jafar G: Formulation of gel kefir product of milk fermentation and antibacterial activity tests against Propionibacterium acnes. Int J Pharm Sci Res 2018; 9(8): 3420-26. doi: 10.13040/IJPSR.0975-8232.9(8).3420-26. Authors Address: Bandung School of Pharmacy, Bandung, West Java, Indonesia.